The data center is alleged to be able to process "all forms of communication, including the complete contents of private emails, cell phone calls, and Internet searches, as well as all types of personal data trails — parking receipts, travel itineraries, bookstore purchases, and other digital 'pocket litter'." 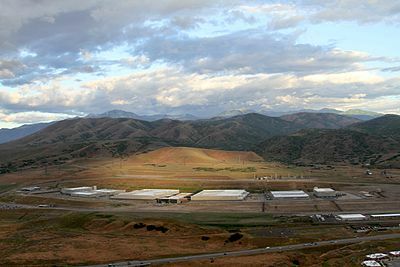 In response to claims that the data center would be used to illegally monitor email of U.S. citizens, in April 2013 an NSA spokesperson said, "Many unfounded allegations have been made about the planned activities of the Utah Data Center, ... one of the biggest misconceptions about NSA is that we are unlawfully listening in on, or reading emails of, U.S. citizens. This is simply not the case." This statement was made two months prior to the document leak that revealed the existence of the PRISM program (below). Some members of the public question the credibility of official statements like Bamford's, above, in light of the revelations made in the following two paragraphs herein, and in light of the revelations made in the following two months after his statement was made. ^ "NSA Utah Data Center". Facilities Magazine. 14 September 2011. Retrieved 24 April 2013. ^ a b Kashmir Hill (July 24, 2013). "Blueprints Of NSA's Ridiculously Expensive Data Center In Utah Suggest It Holds Less Info Than Thought". Forbes. Retrieved 2013-07-29. ^ a b Fidel, Steve (6 January 2011). "Utah's $1.5 billion cyber-security center under way". Deseret News. Retrieved 29 March 2013. ^ a b Shalal-Esa, Andrea (15 April 2013). "U.S. agency denies data center to monitor citizens' emails". Reuters. Retrieved 16 April 2013. ^ Office of the Under Secretary of Defense for Acquisition, Technology and Logistics (September 17, 2014). "MilCon Status Report - August, 2014 - Under Secretary of Defense for AT&L". Archived from the original on December 10, 2014. Retrieved April 16, 2015. ^ "NSA Utah Data Center - Serving Our Nation's Intelligence Community". nsa.gov1.info. Retrieved 2019-02-14. ^ a b c d Bamford, James (15 March 2012). "The NSA Is Building the Country's Biggest Spy Center (Watch What You Say)". Wired. Retrieved 5 April 2012. ^ Eric Lichtblau and James Risen (April 15, 2009). "Officials Say U.S. Wiretaps Exceeded Law". The New York Times. Retrieved September 5, 2012. ^ Poitras, Laura (August 22, 2012). "The Program". The New York Times. Retrieved August 5, 2016. ^ Gellman, Barton; Poitras, Laura (June 6, 2013). "US Intelligence Mining Data from Nine U.S. Internet Companies in Broad Secret Program". The Washington Post. Retrieved June 11, 2013. ^ James Risen & Eric Lichtblau (June 8, 2013). "How the U.S. Uses Technology to Mine More Data More Quickly". The New York Times. Retrieved June 11, 2013. ^ Howard Berkes (June 10, 2013). "Amid Data Controversy, NSA Builds Its Biggest Data Farm". National Public Radio. Retrieved June 11, 2013. ^ Thomas Burr (June 6, 2013). "Phone records could end up at NSA's Utah Data Center". Salt Lake Tribune. Retrieved June 11, 2013. ^ a b Siobhan Gorman (7 October 2013). "Meltdowns Hobble NSA Data Center". The Wall Street Journal. Retrieved 19 October 2013. The Utah facility, one of the Pentagon's biggest U.S. construction projects, has become a symbol of the spy agency's surveillance prowess, which gained broad attention in the wake of leaks from NSA contractor Edward Snowden. ^ "NSA Collects 'Word for Word' Every Domestic Communication, Says Former Analyst". PBS NewsHour. 1 August 2013. ^ James Bamford (August 2014). "Edward Snowden: The Untold Story". Wired. ^ a b c d e Kenyon, Henry (Jan 7, 2011). "New NSA data center breaks ground on construction -- Defense Systems". Defense Systems. Retrieved 11 August 2011. ^ "NSA to store yottabytes in Utah data centre". CNET Networks. Retrieved 11 August 2011. ^ Bamford, James. "Who's in Big Brother's Database? by James Bamford". The New York Review of Books. Retrieved 11 August 2011. ^ LaPlante, Matthew D. (July 2, 2009). "New NSA center unveiled in budget documents". Salt Lake Tribune. MediaNews Group. Retrieved 2009-07-05. ^ LaPlante, Matthew D. (July 2, 2009). "Spies like us: NSA to build huge facility in Utah". Salt Lake Tribune. MediaNews Group. Retrieved 2009-07-05. ^ Adams, Andrew (July 12, 2013). "New Utah NSA center requires 1.7M gallons of water daily to operate". Retrieved 2013-07-25. ^ a b "NSA data center 'crippled' by huge power surges". DatacenterDynamics. October 8, 2013. Retrieved April 27, 2014. Wikimedia Commons has media related to Utah Data Center. "James Bamford: Inside the NSA's Largest Secret Domestic Spy Center, part 1". & "part 2". Greenwald, Glenn; MacAskill, Ewen; Poitras, Laura (9 June 2013). "Edward Snowden: NSA Whistleblower". The Guardian. London.